Description: Former MRS-1 Military Locomotive built by EMD. copyright 2006 Larry Platt photo, please do not download, copy or post elsewhere without permission. Description: HVRR 1813 does the honors on this Mother's Day speial on the Heber Valley Railroad. Description: Two of Heber Valley Railroads Diesel's together with the new paint scheme #1813 was painted just a few days before this picture was taken. 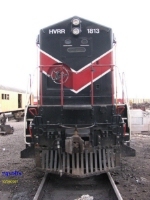 Description: HVRR # 1813 in the new paint that resembles the D&RGW heritage. 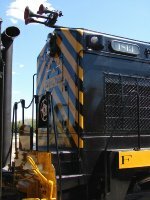 The Rio Grande is the railroad that built the Heber City Branch. Description: 1813 waits on lead while the crew prepares for the departure of the Monday night train in a few hours. Description: The Provo Canyon Limited passes approaches Heber City with Mt. Timpanongos looming in the background. Description: The MRS-1 idling waiting for the departure of the booked out Monday Night Train. Seven passenger coaches are hooked up to the train ready to haul a large crowd. Description: The MRS-1 leaving Heber Yard with seven coaches in tow hauling the Monday Night Train on a crowded Labor Day.